Professor Qualls assigned us Piccadilly Circle. The hardest part was figuring out what Tube station to start from – we didn’t know what was the closest to the Arran Hotel, so that took a little bit of aimless walking around Tottenham Court Road (not that we’ce complaining). It was the Goodge Street station we were after, and we think that being able to find it will be useful before long. Matt spent the summer in New York City, and Mary Kate has used the New York subway on occasion, and neither of us has ever seen anything quite like the Tube. Its walls are plastered in colorful ceramic tile – untainted by graffiti – and the advertisements lining the walls of the railway promote opera and theater. In speaking of opera, the performers trying to make money in the subway seem to have a different repertoire here: we heard an opera singer and soft-rocker on a keyboard in our stations today. The Goodge Street station also featured a winding staircase of 136 stairs – we were surprised when we expected to run down two flights as a quicker alternative to the lift. We took Goodge to Tottenham Court Rd, and from there we transferred to the Piccadilly Line at Leicester (pronounced “Lester”?) Square. None of our rides on the Tube were longer than 90 seconds, and every time we found our platform, the Tube train was already waiting for us. (The instant train access was another thing we weren’t used to from American subway systems.) When we climbed out of the Piccadilly Station, named for the Piccadilly Circus, and into the City of Westminster, we felt a world away from Gower Street. “This is the Times Square of London,” Matt immediately remarked. Flashing lightbulbs, MacDonald’s advertisements (and stores), punk rockers with orange spiked hair posing for pictures (for a few quid), and plenty of traffic made us feel more like we were in an American city than we have felt yet. The architecture of the buildings , though– on the second level, above the franchise coffee shops and tourist-y clothing stores – reminded us we were in London: regal brick and stone with ornate facades, often topped with statues or domes lined the streets in all directions. Several tourists asked us to take their pictures in front of statues, and we spotted a few posing outlandishly in front of fountains. Our favorite memorial statue in Piccadilly Circus was a little further away from the hustle and bustle surrounding the central fountains and monuments. We gravitated toward the Crimean War memorial. (Although it should be noted that actually getting across traffic to reach the memorial is much easier said than done.) 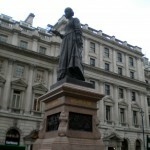 It featured a statue of Florence Nightingale, where people continue to leave bouquets of flowers in her honor. Getting back to the Arran House (even in our fog of jet lag), proved to be a snap. 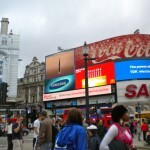 We took a different route – Piccadilly to Oxford Circus to Tottenham Ct. Rd. and a three-block walk home – and got to see a few pubs and store fronts we missed the first time around. Nice work. In future posts, see if you can add some informative links. As for buskers (street/tube performers): ask me about them at our first class session. It is a fascinating story of culture and government.